Once voted "Best Singer" in Scene's Best of Cleveland campaign and a regular nominee in the Ohio Hip Hop Awards, local soul singer Lauren Lanzaretta is one of the more active aritsts on the local scene. 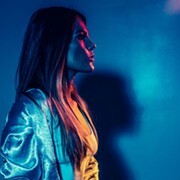 She generated plenty of hype with her full-length debut, 2014’s Naked Soul, and she’s currently working on a new album with local producer Jim Stewart. Deliverance, the Stewart-produced full-length, will likely drop in early 2018. In the meantime, you can catch a glimpse of the album by checking out Lanzaretta’s new single, “Calm the Storm.” It features backing vocals from the talented local group JABTUNE and a string arrangement courtesy of Alex Hitchens. Lanzaretta has also released a new music video. Appropriately, the tune has a gospel feel; it also allows Lanzaretta to show off her remarkable voice.